Closet full of clothes and nothing to wear or maybe the closet is not full but you get what i am trying to say, you have nothing to wear doesn’t feel good right! now add to it the pressure of attending a big event like fashion week. This was my situation when i last minute decided to attend the india fashion week in delhi. I think i was just stupid to not plan for it. Should not even start about that as i still feel like slapping myself!!!! Basically i had no outfit so the only option left was to use my styling sense to come up with a fashion week worthy outfit with pieces existing in my wardrobe. Layering is the first word that comes to my mind when thinking of fresh outfits with existing pieces. 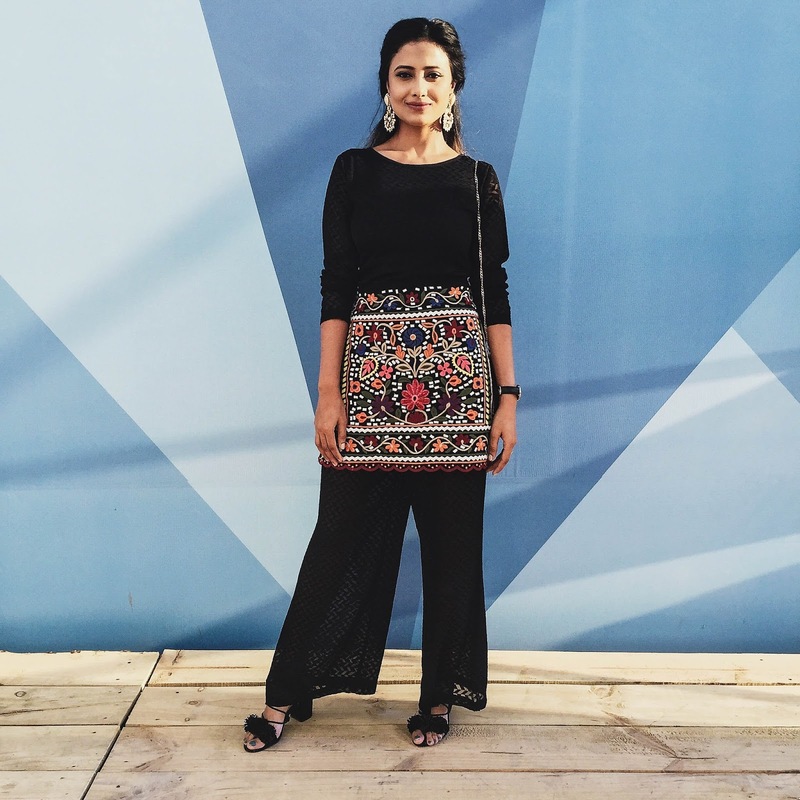 And matching sets had saved me many a times in the past so i thought of this black one which is probably 3 years old and put this black embroidery skirt from this summer on top and voila i had my outfit. The pieces were old but the outfit was totally fresh and forward for autumn 2016. Think of layering like in todays outfit, or adding a vest on top of ur off shoulder top, etc. Spring, autumn and winter u can really use this technique to come up with multitude diff outfits. Combine different moods like embroidery with clean cuts. Change your footwear like your ultra feminine pleated midi that you have worn with heels and sleek shoes now wear with edgy boots. Create a pinterest board of outfits that involve the pieces or similar pieces that you have in your wardrobe. So whenever you come across any outfit that u like or find fresh on blogs, fashion websites, instagram, google search or pinterest just pin it to that board and refer to it whenever you are stuck. I am totally in love with this super easy braided half updo. Looks great on long hair and if u too want to achieve that clip in hair extensions and tape in hair extensions from omgnb are great. It's so hard choose the perfect dress for the fashion week...I love your outfit and your hair is so beautiful! I love layering outfits up to get a new look. Your hair is amazing! WOW!!! Chichi, I think it worked out well that you prepared this look last minute because it's such a gorgeous outfit and you look absolutely amazing! I love the way the skirt looks layered over the pants, it add such a nice vivid contrast! This outfit screams Fashion Week and I'm sure your outfit was a fan of many! Thanks so much for sharing, gorgeous, and I hope you have the most amazing weekend ahead! Gorgeous look! I love the layered skirt with those pants! So chic! Shopping my closet is something I do very often. Luckily there's always a surprise in there for me. I am in love with your skirt over, so cute!! I love this look. The skirt layered over black trousers looks amazing. Your personal style here is so gorgeous; a fabulous mixture of pairing plenty of black material with pattern. Beautiful! This actually reminded me that I should rearrange my closet. Really nice tips. One can never go wrong with layering and accessorizing, that takes outfits from 1 to 100. You look so dashing dear! Thank you for comforting me, I hope I will find a phone soon. Thank you! This last minute outfit is amazing! Love how you paired the co-ord with a skirt on top <3 and your hair looks awesome as always! I love your look! So chic and gorgeous! That is such a gorgeous skirt. Love how you wore the skirt on top. love the braid in your hair! awesome tips too! super cute post! 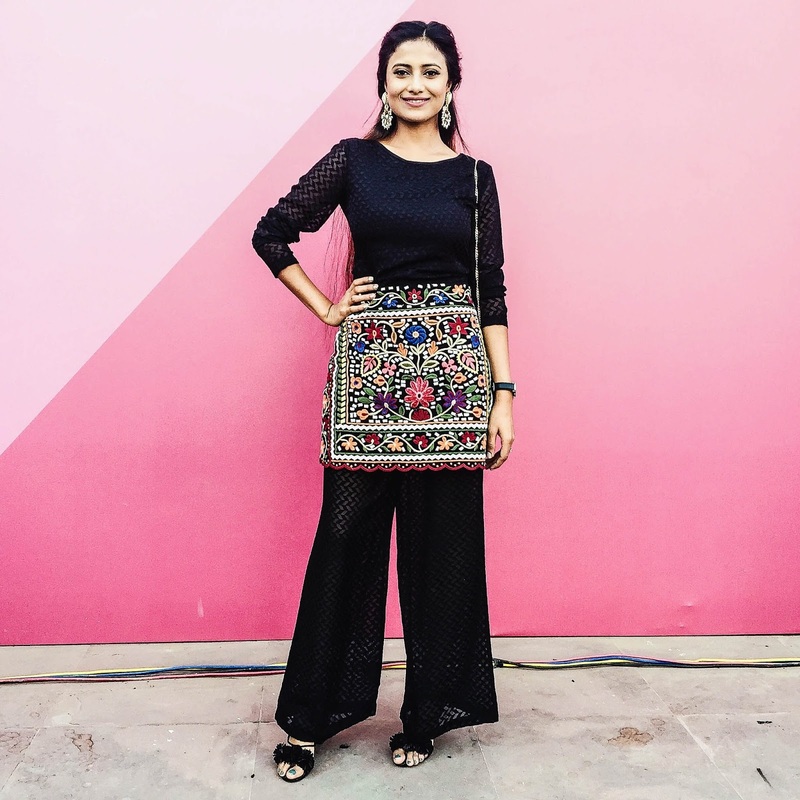 Love this exotic ensemble AND you look divine! Such great creativity to add this skirt over the pants! I think it's worth the time to experiment with our clothing and outfits!! I love how you layered this look...wearing a skirt over pants is such an original idea. You look fantastic!!!!!!! An amazing look! Really gorgeous! I love this unique look, so fab! I love your unique sense of styling and layering so much. You always have such a surprising effect. Love this outfit that you wore. Such great tips. Hope you had a great time in the event.